It's Pi Day! Put down your forks, it's not THAT kind of Pi. π is a mathematical constant, the ratio of a circle's circumference to its diameter, commonly approximated as 3.14. So we celebrate Pi Day on 3/14. Pi day is a celebration of all things math. This year, Project MC2 Is using Pi Day to let kids know that Nerds are Cool. Every year 1 in 4 children report being bullied at school. Often times it's the "smart" kids who are singled out to be bullied. This kind of bullying can deter a child from pursuing their interests in an effort to fit in. That's why the "Nerds are Cool" message is so important. The future is in science, technology, engineering, art and design, and math. It's important now, more than ever, to foster the love of learning and the interests of our children. Nerds are Cool, and they are our future. 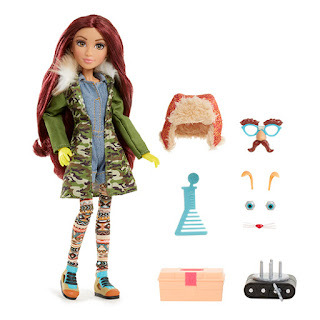 Project MC2 has an awesome line of dolls and playsets that go along with their Netflix series, that help foster a child's interest in S.T.E.A.M. (science, technology, engineering, art and design, and math) Some of the dolls come with "science projects" that are a ton of fun while opening a child's mind. The toys cover a wide range of interests and are a lot of fun. I bet my nieces would love those dolls! They are so into dolls like that right now. My daughters love dolls. I bet they would just love these! I love that the one comes with a wind up robot. Very neat! This is such a great project! I love that they are trying to change bullying and I totally think smart should be the new cool! What an awesome project!! My girls would love these doll sets they are right up their alleys. Wow - I hadn't heard of these before, but will definitely check them out for my nieces! Thank you so much! My daughter is a nerd and she is embracing that part of her. I love this campaign! Kids should celebrate whoever they are! I did not know they had a Netflix series. I will have to share this with my friends with little ones. What a great message that this campaign is trying to get across to everyone. Everyone has their strengths and they shouldn't be bullied for being "smart". I've seen these in the store. I didn't know they had a series too. Science projects come with some of them? That is the coolest thing! My daughter has one of these dolls and a journal. She loves learning about science in this fun way too.